On arrival at Noi Bai Airport, you will be warmly welcomed by English speaking tour guide and then transferred to hotel and check in. Ha Noi, Vietnam’s capital is one thousand year old city with peaceful lakes, French style buildings, old quarter streets, tree lined boulevards, brightly painted temples and pagodas. Ha Noi is one of Asia’s most charming cities. 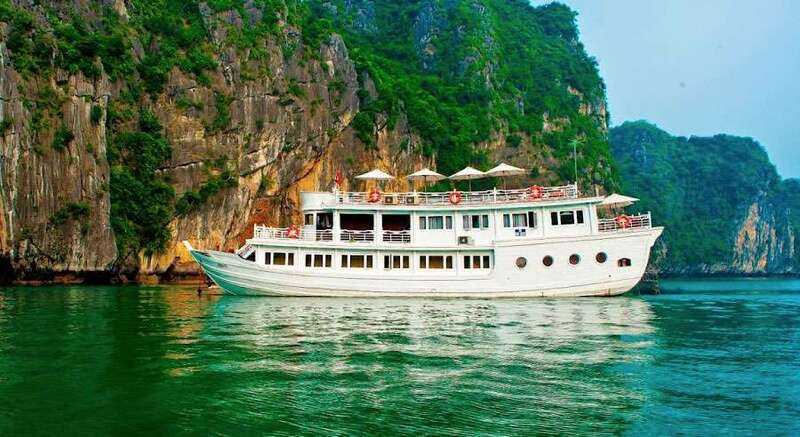 Travel from Hanoi to Halong Bay to cruise amongst the bay’s spectacular scenery. After check-in and security briefings, you will set sail, enjoying lunch while cruising through fishing village. At night, you can ask the cruise to go on squid fishing at night. Enjoy a cooking demonstration with the chef as he prepares traditional Vietnamese food. Start a great the day to view the sunrise over the bay. After breakfast, visit beautiful limestone grotto then back to the boat for a final glimpse of the Halong Bay. Have the brunch while cruising back to the dock. Back to the wharf. Say goodbye Halong Bay and transfer to Hanoi. By 07:40 - 8:30: Meet your tour guide at the hotel. Visit Ho Chi Minh’s complex, the final resting place of Vietnam’s greatest father; his house-on-still and One pillar pagoda – modeled after a lotus flower, a symbol of Hanoi. Visit Ethnology museum to learn about cultures of 54 ethnic groups living in Vietnam. Description: Halong Bay Full-Day Trip-Enjoy this full-day trip to Halong Bay from Hanoi, including a scenic round-trip drive through northern Vietnam’s rural landscapes. Enjoy a seafood lunch as you take in the magnificent scenery, stopping to explore karsts and caves such as Thien Cung (Heavenly Cave) with an experienced guide. Inclusions: Hotel pickup and drop-off.Lunch.Local guide.Entry/Admission - Temple of Literature & National University.Entry/Admission - Chua Tran Quoc. Description: Private Hanoi Full-Day City Tour-Hanoi full-day city tour. You will have chance to visit some highlights in Hanoi.